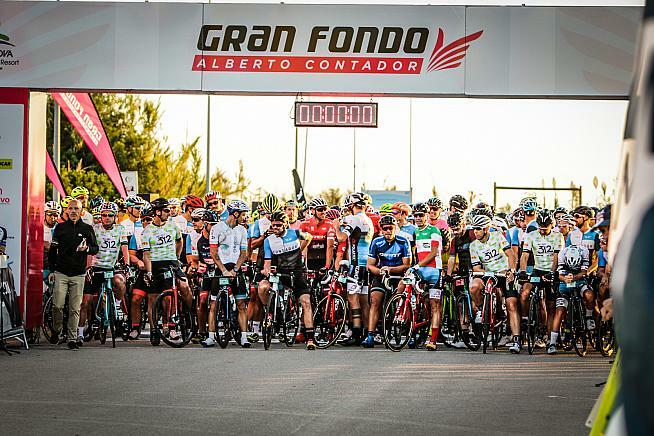 Registration is now open for the 9th edition of the Gran Fondo Alberto Contador. The sportive will take place on the 21st of September on the east coast of Spain in Oliva, with a choice of two traffic-free routes. 20% gradients may be 'nice' for El Pistolero but will be a challenge for most riders on the Gran Fondo Alberto Contador. The addition of a second distance is new for 2019, and means riders can opt to ride either 167km (104 miles) or 115km (71 miles). The longer route features nine climbs with 3114 metres of elevation gain; with barely any flat stretches, its highest peak will be the Muro de Tollos, standing at an altitude of 863 metres. "We have included all of the mountain passes where professional cyclists usually train in the Gran Fondo Alberto Contador. The particularly challenging ones are Coll de Rates and Mirador del Xap, which has considerable ramps, making it a nice way to end the 167 kilometres", says Contador. The Coll de Rates also features in the shorter route that measures 115 kilometres and has 1667 metres of climbing. Mirador del Xap has average slopes of around 10% with ramps that reach inclinations of up to 18% and even 20%, both at the start and at the end of the climb - we suspect not everyone will agree with Contador's assessment of this as a "nice" finish! Event HQ is at the Oliva Nova Beach & Golf Resort in beautiful Valencia. Luckily the event HQ is well provided with amenities for recovery and relaxation: the start and finish for the sportive is at the Oliva Nova Beach & Golf Resort, which will be the focal point of the gran fondo. As the headquarters and official accommodation of the Gran Fondo Alberto Contador, the resort will host an event Expo area alongside full services for visiting cyclists: food, drink, massage, mechanics - you name it. Arrivo Cycling, the event's official travel agency, are offering special packages including race entry, accommodation in the Oliva Nova Beach & Golf Resort Hotel with spa circuit included, a gran fondo commemorative jersey, and more. It may be a long way off, but Contador is already advising participants to put in the miles as preparation. The Tour de France, Giro d'Italia and Vuelta a España winner recommends that participants train for the race due to its "challenging nature" - but also looks forward to riders "enjoying this cycling celebration in a route that is completely closed-off to traffic, which is a true privilege." For more details and to enter the Gran Fondo Alberto Contador, visit the event website at www.granfondoalbertocontador.com. All you need to do is sign up with us and then fill in our submit event form.